Quality, sustainability and the environment. KWH Holland is well-known for its innovative solutions for fruit crop protection systems. By way of example, KWH Holland is the first and only sprayer manufacturer to certify all of its mist sprayers to be 95% drift-free. This is unparalleled in this market. These solutions are well-known for their quality and long service life. In addition, sustainability and the environment are key themes in the development and production of KWH systems. In addition, the company provides progressive resource-saving solutions for the cultivation of lane trees and controlling weeds. 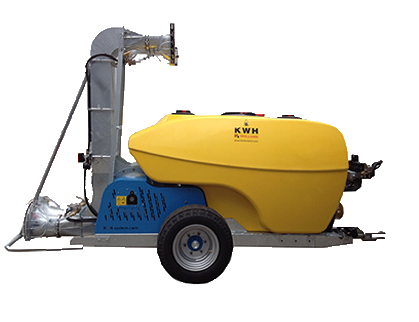 In addition, KWH Holland is the only manufacturer to offer a special line of organic spray machines that emphasise our future vision. For all of these solutions we exclusively use high-pressure precision fans designed and manufactured in our own factory. When you purchase a KWH product, you not only purchase a mist spraying system, the entire KWH Holland partner network is at your disposal. Together with our service partners we provide you with accurate advice and fast repair. KWH Holland not only delivers innovative products; it also makes innovate contributions to the development of farming solutions. KWH Holland removes your concerns relating to your farming operations. Leasing/financing/full-service solutions. KWH offers a comprehensive range of possibilities for maximising your operating result. Contact us or your dealer to discuss the possibilities. KWH Holland’s products are constructed using the latest innovative technologies whereby we focus on lean manufacturing, sustainability and modular construction. This not only makes the application, but also the machine, sustainable and future-proof. The Research & Development department guarantees product innovation and continuous quality improvement. In addition, KWH Holland dealers are actively supported with customisations for their specific market conditions and target groups. KWH Holland’s high and low-pressure mist systems have been sold throughout the world for 70 years. KWH’s low and high-pressure systems are not only the key to our success, they are first and foremost the key to the success of your farming operations. fruit cultivation sprayer in the world. Development of the integrated KWH touchscreen spray computer. First unmanned tractor that can unmanned spray and mow. Nominated for Innovationprice Rivierenland 2013. Environmental Certification for the Mistral Lateral flow. Familie De Brave start KWH Whirlwind. With help of Marshall Hulp is the original bicycle factory of familie De Brave constructed in to a company that specializes in spray for fruit production. KWH Whirlwind and Kiekens Whirlwind Holland form together the new KWH Holland. The pressure systems of Kiekens Whirlwind Holland are like puzzle pieces added to the spray systems of KWH Whirlwind. Curious about KWH Holland solutions at home and abroad?